William F. Stanley worked his way from rather humble beginnings to become a wealthy entrepreneur, engineer, inventor, philanthropist, and one of the leading men of Croydon, Surrey. Among his many inventions was the wire-spoke bicycle wheel that we still use to this day. He began manufacturing and retailing mathematical and drafting tools in 1854, in Holborn, London. Within 10 years, he had expanded his product line to include microscopes, focusing on mid-priced, decent-quality instruments for students and middle class buyers (Figure 1). Slides are often found with Stanley’s retail label, almost all of which were produced by well-regarded professionals (Figure 2). The labeling of many such slides suggests that they were made specifically for sale by Stanley. An 1883 letter to the editor of The Students’ Journal gave Stanley’s price for medically-oriented slides, and information that he also supplied unmounted anatomical/pathological specimens, “Sir, In reply to the ‘proposition’ of ‘Spes in Fides’, in the Students' Journal of the 10th inst., I shall be pleased to supply pathological specimens such as the students require at the rate of 1s. 6d. per slide, which would come cheaper than the £1 1s. for 3 months, as suggested by ‘Spes in Fides’. Also I am supplying a set of 20 sections in tubes, ready cut and stained, for 6s., which I think will be a great boon to medical students to mount themselves”. Figure 1. Three microscopes that were produced by W.F. Stanley’s works. All are engraved with the address “Railway Approach”, indicating production dates after ca. 1873. Images from internet auction sites, used for nonprofit, educational use. Figure 2. 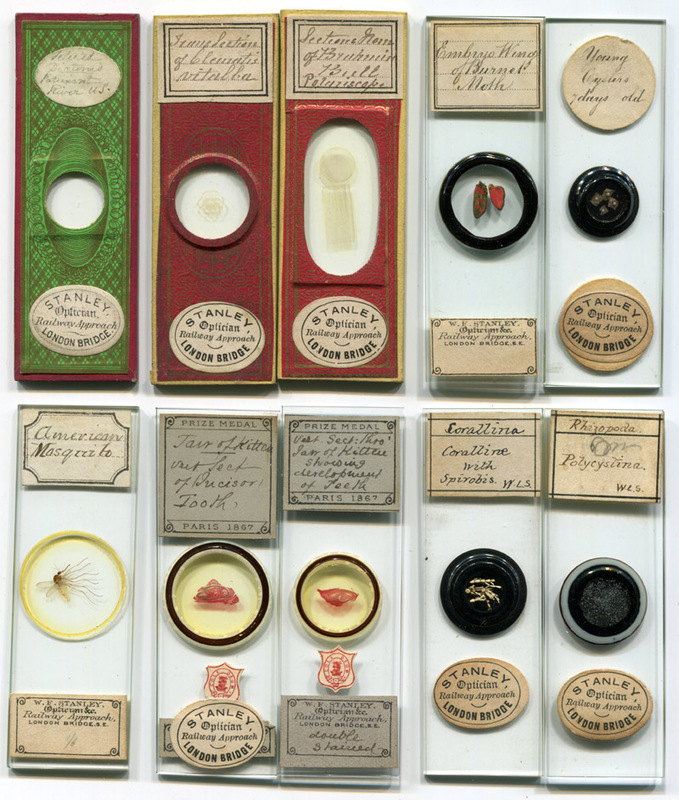 Examples of microscope slides retailed by W.F. Stanley. Top row: 1 by professional John Barnett, 2 by professional Amos Topping, and two by members of the John Norman family of professional slide-makers. Bottom row: 1 by professional Frederick Enock, 2 by professional Arthur Cole, and 2 by amateur William Low Sarjeant. 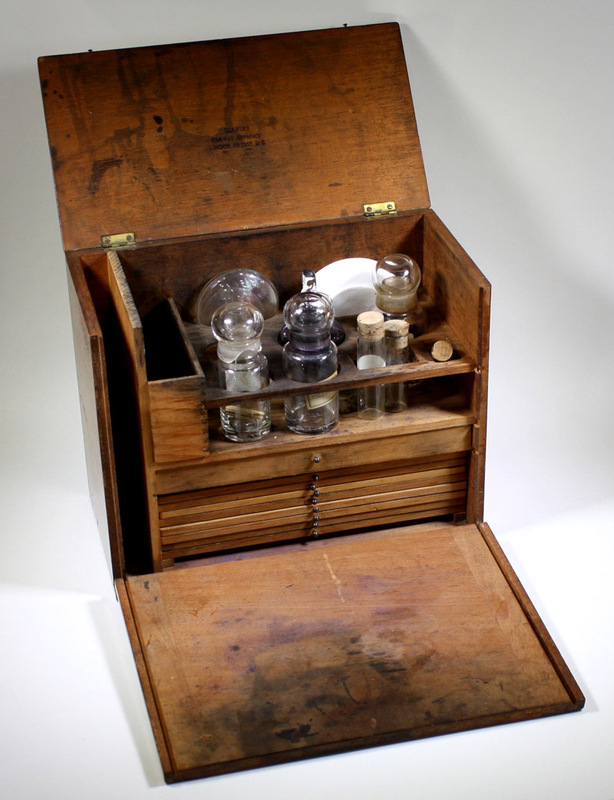 Stanley and Sarjeant knew each other, and co-invented an actinometer for photography. Note that the Cole slide on the right has a lower label with Stanley’s name and address, and Cole’s handwriting, indicating that it was produced specifically for Stanley. Cole also made similar slides for microscope retailer Charles Baker. Figure 3. A portable slide-making kit, by W.F. Stanley. Measuring approximately 8 x 6 x 4 inches (20 x 15 x 10 cm), the box contains storage space for balsam and chemical bottles, crucibles, ringing turntable, an drawers for slides and small accessories. Image from an internet auction site, used for nonprofit, educational use. Figure 4. 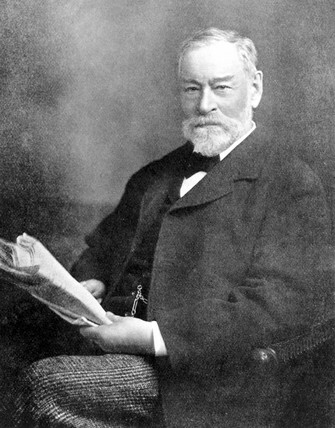 William Ford Stanley. Image used for nonprofit, educational use. As a result of his many successes, there are quite a few books and internet sites dedicated to Stanley, including an entry in the UK Dictionary of National Biography and Wikipedia. Several citations and links are provided in the Resources section at the end of this essay. Herein, we primarily focus on Stanley’s involvement with microscopy. William Ford Robinson Stanley was born on February 2, 1829, is Islington, Middlesex (now London). The 1912 Dictionary of National Biography incorrectly gives his birthplace as Buntingford, Hertfordshire, possibly because he lived there during the early 1850s. Stanley reportedly dropped the use of the middle name “Robinson” in the 1850s, and is generally referred to as William Ford Stanley. William was the second child, and eldest son of John and Selina Stanley. John was a carpenter and builder, and William’s working with his father was reportedly a major inspiration for the engineering instrument business. William went to school from ages 10 to 14. In 1843, his father pulled William from school and put him to work, first with father John and later as a plumber and carpenter. An uncle reportedly paid for William to attend classes in technical drawing and modeling at the Birkbeck Institution (now University of London). William was evidently less than 20 years old when he invented the wire-spoke wheel. Between 1849 and 1854, William lived in Hertfordshire, in a building partnership with an uncle. There, he continued studies in architecture, astronomy, geology, and chemistry. He and a partner founded the Buntingford Literary Institute which, by charging members a subscription fee, formed a library of some 300 books. William moved back to London in 1854, and, inspired by his father’s complaints about the poor quality and high cost of English drafting tools, began a business to remedy that sad fact. He opened a shop at 3 Great Turnstile, Holborn, London. Either before the opening or shortly thereafter, he partnered with a cousin, Henry Robinson, and the business was known as Stanley and Robinson. An early invention was a simplified means to produce stereoscopes. Whereas previous instruments retailed for about 5 shillings each, Stanley’s “Panoptic Stereoscope” could be made at a fraction of the cost and profitably sold for only 1 shilling. Sales were substantial and brought a large amount of capital into the company. A second retail shop was soon opened at 3 Holborn Bars. In 1856, they introduced a revolutionary T-square, which also became much in demand. The Engineer described it, “Stanley and Robinson of 3, Great Turnstile, Holborn, have introduced to our notice a new construction of instrument for drawing, which, for simplicity of arrangement, surpass any T square at present in use. The stock, which slides on the edge of the drawing-board, is made plain in the ordinary manner, having the upper edge bevelled that the square may not work on the extreme edge of the board, where the board is liable to got bruised or otherwise injured; the blade is a thin piece of wood as usual, but made wide at the stock end, and tapered off narrow towards the point Another advantage of these squares is a that the set square can slide over the stock”. Figure 5. A. An 1857 advertisement from Stanley and Robinson. Henry Robinson died in 1859. B. An 1860 advertisement from W.F. Stanley. William married Eliza Ann Savory in February, 1857. Initially, they lived above the shop at Great Turnstile. Within a few years, they moved to a separate home, and settled in Surrey in the mid-1860s. The couple did not give birth to any children, although they adopted an orphan, Maude Martin, in the 1880s. The 1861 census recorded that Stanley then employed 12 men and 5 boys, a substantial operation. He submitted two entries into the 1862 London International Exposition: “ Stanley, W.F. 3 Great Turnstile, WC – Mathematical and surveying instruments” in Class 13, Philosophical Instruments, and “ Stanley William F., 3 Great Turnstile, Holborn, London – Mathematical Instruments, case in aluminium, engine divided scales, &c.” in Class 29, Educational Works. His Class 13 entry won a medal, which was frequently touted in later advertisements, even for items unrelated to the judged instruments (which was a common practice among manufacturers and retailers) (Figure 6). Figure 6. Early advertisements for microscopes. Left, 1863 ‘The Lancet’, and right, 1864 ‘The Intellectual Observer’. The cited 1861 medal had nothing to do with microscopes! Figure 7. 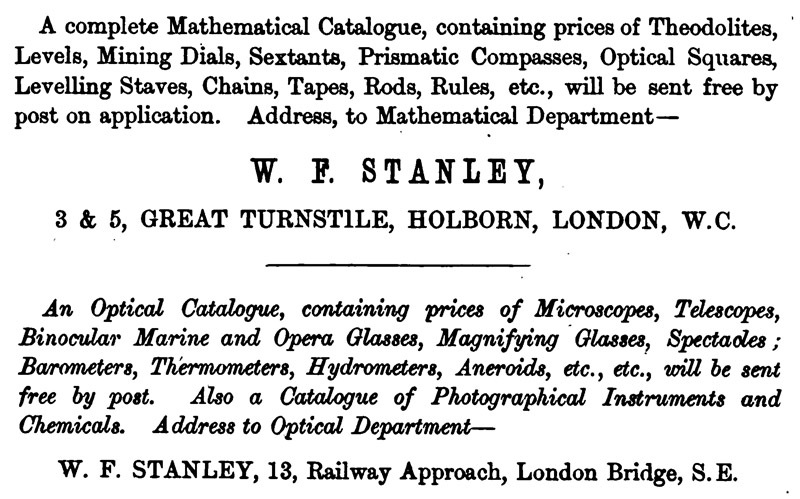 Information in Stanley’s 1873 ‘A Descriptive Treatise on Mathematical Instruments’ (fourth edition), indicating that he operated two main ‘departments’, each at a different addrress: the Mathematical Department at 3-5 Great Turnstile and the Optical Department (including microscopes) at 134 Railway Approach. London Bridge. The earlist identified references to the Railway Approach address are from 1873, suggesting that he opened this shop during that year. 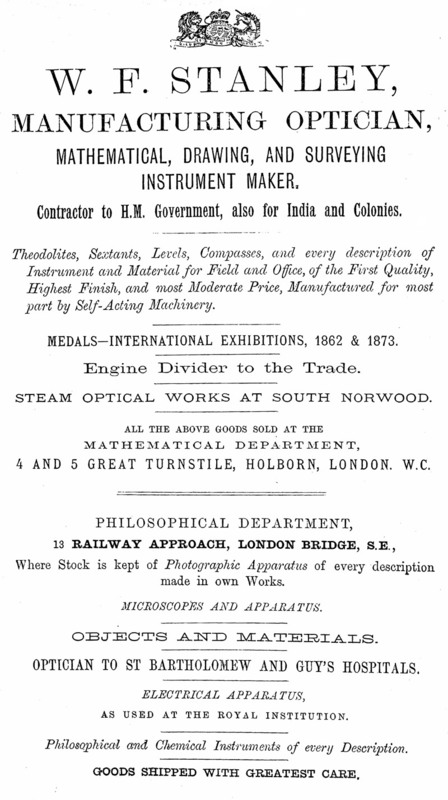 “Mathematical Drawing Instrument Making Works, South Norwood. A visit paid by us to the mathematical instrument making works, recently established at South Norwood by Mr. William Ford Stanley, afforded us considerable pleasure. Mr. Stanley has been hitherto known for many years as a maker of repute in Holborn, London, and not merely a seller of, all kinds of mathematical drawing instruments, as well as an inventor and improver of several more, for the use of architects, engineers, surveyors, and others. The thought occurred to Mr. Stanley's inventive mind some years since that, as several forms of labour, simple and complex, were being brought under the dominion of machinery, the making of mathematical instruments ought to form no exception, and that machinery and steam power could be utilised to any extent in the production of perfect instruments, and that the cost to producer and purchaser would eventually be considerably cheapened. The task to be undertaken was an anxious, and was likely to be an expensive, one, for the transition from hand labour and common lathes to steam-driven machines necessitated not only the making of a number of separate machines, but included the making of a number of subsidiary tools for use, and in the teaching of a number of workmen how to use these new tools with safety to themselves and with as little serious loss as possible in the matter of time and material to the employer. 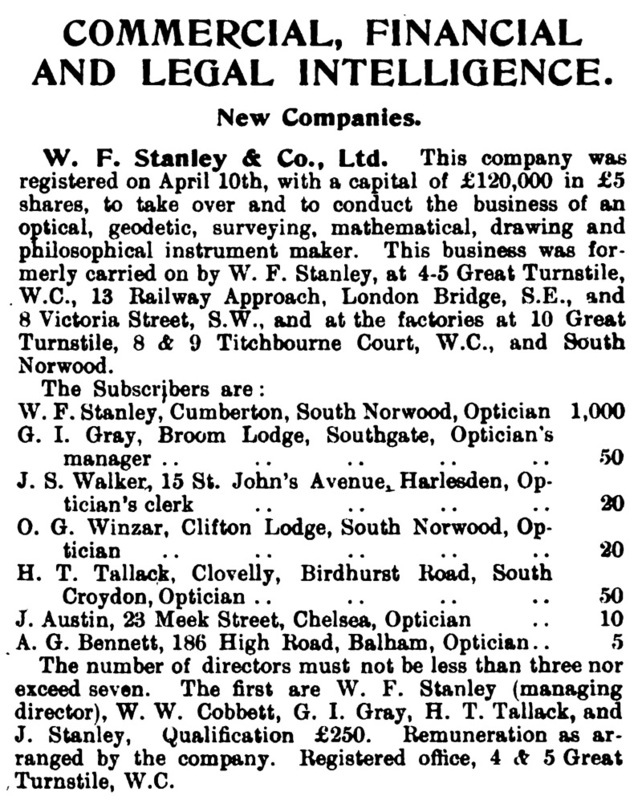 After an outlay of several thousand pounds, Mr. Stanley has now in operation at his manufactory at Norwood machinery for the production of all the mathematical instruments known as the half-set case, which includes compasses with a moveable leg, ink point, pencil point, lengthening bar, drawing pen, &c., and with his present resources is capable of producing any amount of these instruments, with their cases, of all sizes and of any material needed. After a short time he will have mechanical appliances perfected for producing what is technically known as the set case, and doubtless in due time he will further produce the full-set case and the long-set case. In his workshops at present he has machines in motion to the number of 25 or more, solely engaged in the adjusting and finishing of the instruments of the half-set case, the casting being a separate and previous operation, carried out in another part of his works. In one room are cam machines for dividing and marking the scales upon rules, and for producing a variety of scales used for measuring and drawing purposes. This dividing machine can be adjusted and used for marking boxwood, iron, brass, German silver, horn, ivory, vulcanite, or other material. The movement of the machine is perfect, and there is alternately a long and a short action in marking the indents or lines that form the scales. The division of labour that necessitated in the many operations belonging to the mathematical instrument making renders separate rooms or workshops to be allotted to each class of workmen, and these are provided in Mr. Stanley’s buildings, many of them being on the same level, so that as soon as a number of parts of one instrument are ready they are passed on into another workshop. The principal machine-room, or workshop, contains a number of compact machines, all driven by steam power, and worked on the cam principle, which, commonly speaking, may be described as a plate with curved sides fixed on a revolving shaft for converting a rotary motion into a rectilinear one. This principle is utilised to a great extent, and in a very beautiful manner, in the various operations belonging to the final cutting, rounding, shaping, and finishing of the heads, sides, faces, chamfers, and diminishing ends of the pairs of compasses and other drawing instruments, and equally so in the stamping and marking processes. When the head of a compass is perforated and slit for the jointing operation, the centres or eyes of the pair are worked from in each after-operation; for whether the motion be horizontal or circular, so long as the same centre is maintained in adjusting or fixing the article worked upon, the operation of the machine will be perfect, - hence every leg, arm, or corresponding part of an instrument will really correspond in all its details, and exhibit no irregularities. Although Mr. Stanley and his brother had to invent machines, construct new tools, and educate or teach their workmen, it is surprising with what facility some of the young men in his workshops perform their allotted work with the aid of the machines. In a second the circular or rotary motion of a cutting tool is changed into a rectilinear one, and the perforating or cutting tool after boring, can be made to slide from right to left in a grooving or rabbeting process. The brass or other metal is bored, slit with a saw, cut, planed, traversed, rounded, quirked, stamped, marked, and otherwise finished, as circumstances may warrant, by the aid of machines in Mr. Stanley's works. There is a separate workshop on the premises where the tool makers are employed in forging and finishing tools required by the workmen in the production of the mathematical drawing instruments, and several of these tools are the invention of Mr. Stanley. There is also a cabinet-makers' or case-makers' shop, where all sizes of cases for mathematical drawing instruments are made oak, walnut, mahogany, rosewood, &c. There are machines in this workshop which perform their operations with the same swiftness and exactness as those above stairs. The dovetailing, mortices, or sinking for the locks, hinges, and angle brasses, and other fittings are cut by machines, so the workmen have little more to do than glue and screw. Substantial unveneered cases of mahogany or walnut are made by Mr. Stanley, in which the straight dovetailing, or, more properly speaking, the combing is done by machines, and done so accurately that sides and ends fit into each other so closely and tight that glue might nearly be dispensed with. As we are not writing an exhaustive description of Mr. Stanley's works, but giving merely a brief outline, we will only remark further that his steam engine and driving power and self-feeding furnace is of the best description. The waste brass, cuttings, shavings, dust, and other brass ‘waste’ is not wasted, but is passed through a magneting machine where the particles of iron are caught up by a number of revolving magnets upon a spindle, and thus the brass, which under other circumstances would be a loss or waste with its admixture of iron, is saved for future casting. In passing through Mr. Stanley's works we examined some of the finished drawing instruments in that part of the building called the ‘Finishing Room’, where a number of workmen were engaged in giving the final touches to the articles manufactured. We came unhesitatingly to the conclusion that no mathematical drawing instruments could be better finished, and that they might safely challenge comparison with any instruments made abroad or at home. It is worthy of note that the workshops in general are airy, lofty, well lighted, and ventilated, which must afford great comfort to the workmen, and facilitate their operations. 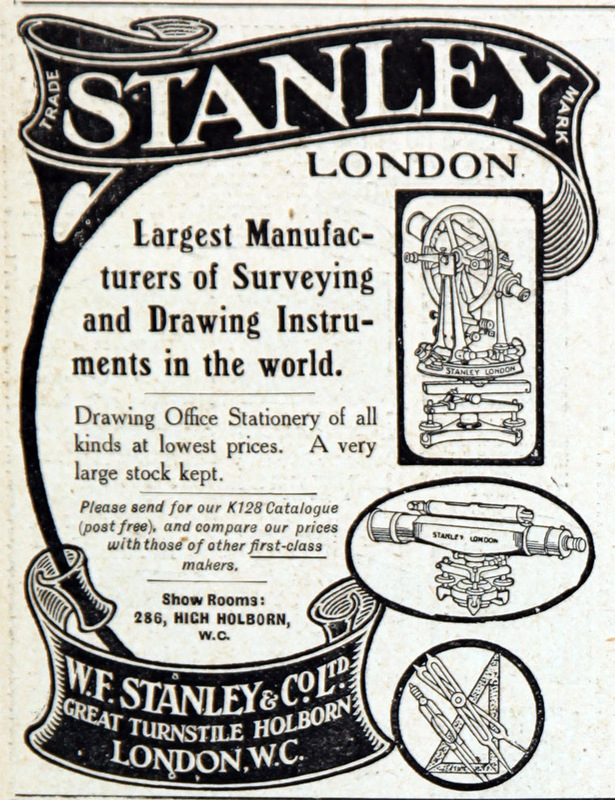 We believe that Mr. Stanley's machine works are the only ones of the kind in this country, and his enterprise is entitled to recognition at the hands of his countrymen, and more especially that architectural and engineering constituency in the service of the Government and apart that he has so honourably served for long years as a practical mathematical drawing instrument maker in London”. 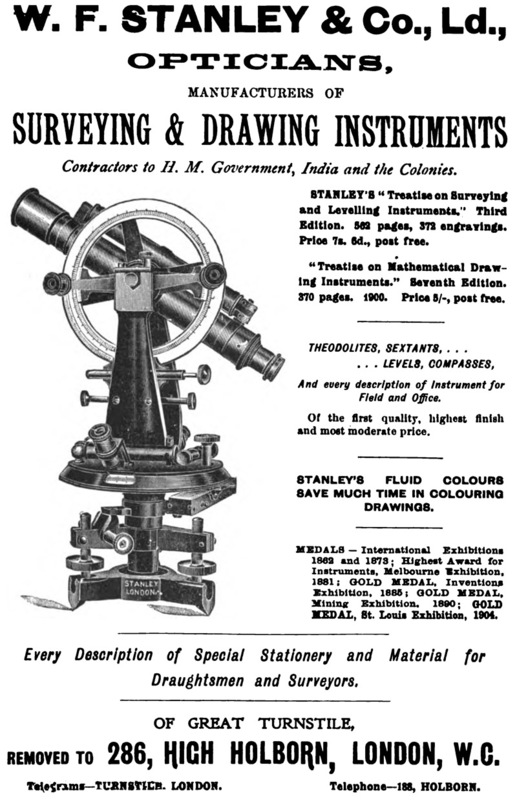 According to his 1881 catalogue, Stanley was then employing 80 people and producing 3000 different items. Figure 8. 1883 advertisement from Ernest Ady’s “Methods of Microscopical Research’. Figure 9. 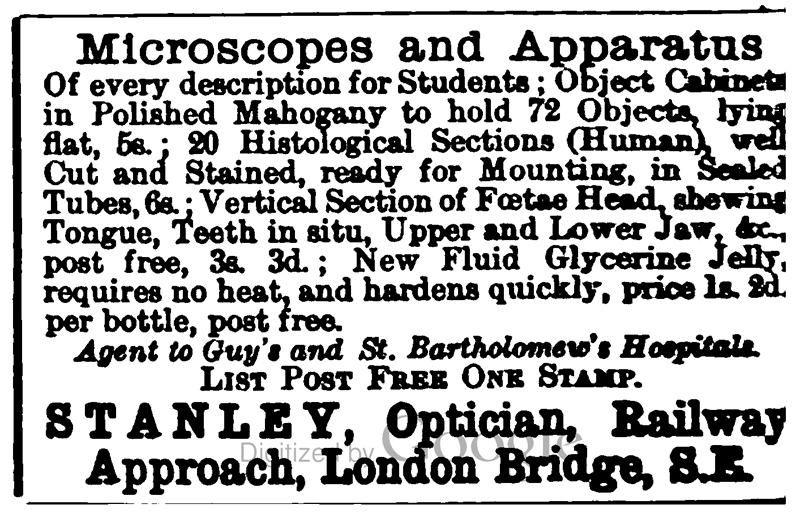 1884 advertisement from ‘The Microscopical News and Northern Microscopist’. Figure 10. 1885 advertisement from ‘The Yearbook of the Scientific and Learned Societies of Great Britain and Ireland’. Stanley and engineer/microscopist William Low Sarjeant patented a new form of photographic actinometer in 1886. A surviving example of their device is shown in Figure 11. This early “meter” was useful for determining exposure time when taking a photograph. This was described by Chemist and Druggist in 1889 as, “A useful and cheap little instrument … for testing the actinic power of light, consisting of a ribbon of paper on a reel, being sensitised with emulsion of a similar kind to that used in dry-plate manufacture. A little of this paper is drawn out, and is exposed to light under a circular hole covered with glass, and as there is a standard tint at the side for comparison, it is obvious that the photographer can in a few seconds see how long his plate should be exposed”. Figure 11. An actinometer produced by W.F. 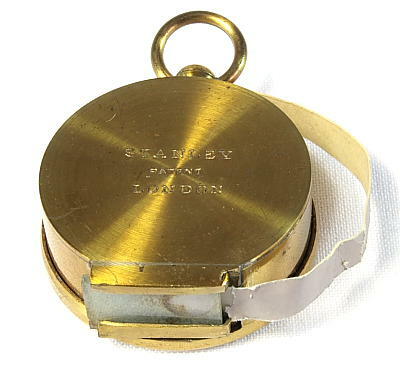 Stanley, from the design patented by Stanley and W.L. Sarjeant. It is roughly the size of a pocket watch, and was intended to be similarly worn on a chain. Image adapted for nonprofit, education use. Figure 12. Stanley incorporated his business in 1900. The “J. 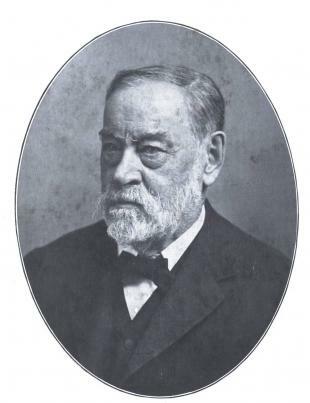 Stanley” on the Board of Directors was presumably William’s brother Joseph (1842-1904). Stanley’s business was incorporated as W.F. Stanley and Company, Limited, in 1900 (Figure 12). William retained the majority of stock. At about 1905, a new shop was opened at 286 High Holborn (Figure 15). The company continued to produce instruments until it was liquidated in 1999. At around this time, Stanley was appointed Justice of the Peace, and was recorded as such on the 1901 census. To further sum up his life, The Dictionary of National Biography wrote, “Stanley's versatile interests embraced geology, astronomy, anthropology, phrenology, painting, music, the drama, photography, and wood-carving. In the intervals of business he lectured and wrote on scientific subjects for learned societies. He became a member of the Physical Society of London in 1882, a fellow of the Geological Society in 1884, and of the Royal Astronomical Society in 1894. An accomplished musician, artist, and architect, he was the composer of part songs; exhibited three oil paintings at the Marlborough Gallery in 1891; and designed his own residence at Norwood. He was fond of foreign travel, and visited Palestine and Egypt in 1889, and Switzerland in 1893. To Norwood, whither Stanley retired in later life, and where he took a prominent part in philanthropic and municipal affairs, Stanley was a generous benefactor. There he designed and on 2 Feb. 1903 opened to the public the Stanley Public Hall and Gallery at a cost of £13,000, for the purpose of lectures, concerts, and entertainments. A clock tower and hall were added in 1904. A further benefaction was a technical school, which was opened in 1907, for the education of boys as skilled scientific mechanics. The school met with instant success, and Stanley subsequently presented the buildings to the public with an endowment valued at £50,000. In 1907 Stanley was made an honorary freeman of Croydon, and a clock tower was unveiled in South Norwood to commemorate his golden wedding”. William Stanley died on August 14, 1909, at his home in Croydon. He left an estate of nearly £60,000, which was distributed among his relatives, employees, and various charities. Figure 13. William Ford Stanley. Figure 14. 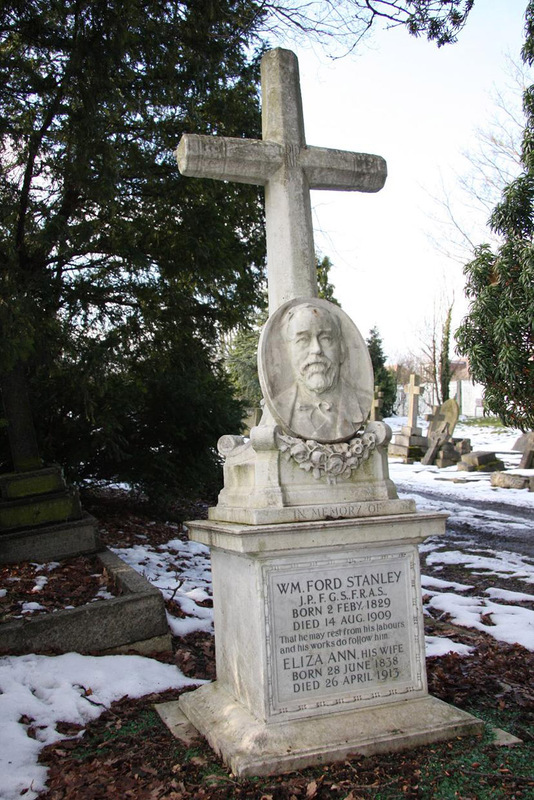 The graves of William Ford Stanley and his wife, Eliza Ann Stanley (1838-1913), Beckenham Cemetery. Adapted from http://www.findagrave.com/cgi-bin/fg.cgi?page=gr&GRid=33774497. Figure 15. 1905 advertisement from W.F. Stanley & Co., Ltd.